Today's theme really tested my metal. As it happened, my mined wasn't quite up to the feet. At 9D I had SCOUTs___ for a long spice, but I could not come up with OATH, possibly because I never was a Scout. I might have gotten to OATH if I had been able to get 43A. Wring. Coming up with the homonym ring was no problem, but for some reason I couldn't pick up on ring as in phone. I circled around and around other types of rings with no success. Insufficient cranial DEXTERITY after last night's late night on the town. I finally asked Horace what it was so I could finish the puzzle and get going on the revue. Dough! The theme is clever, unusual as far as my experience goes, and includes some good material. My favorite is MOBILIZED for Mustard (16A). I also liked Lodes for Loads ALOT, GLIMMER for Re/ray, and Flea/flee/ESCAPE. Among the downs, there was also some nice fill. I liked BISTRE in particular. You don't see that word every day. And ETTU (Classical rebuke). 15D. One for whom work is play? (ACTOR) and 54D. Priest from on high? (LAMA) were cute. 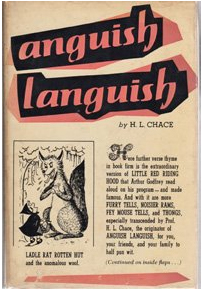 Today' theme reminded me of a story I read when studying language and linguistics in my salad days. It's called "Ladle Rat Rotten Hut" by H. L. Chace. I recommend it. I was also troubled by DRYROTS at 23D. I'm not sure if that's meant to be a plural noun or a verb. That tree dry rots every year. We must find a way to stop the dry rots. Nice review, Franny! I too liked MOBILIZED for mustard, but overall I did not really enjoy completing this offering. It was more work than play, alas. I loved Ladle Rat Rotten Hut! Also brings to mind Mots D'Heures Geusses Râmes. This puzzle definitely played hard for what is essentially a themeless, if only because each clue across had to be reimagined. It was remarkably difficult. Perhaps this is a sign of an aging brain? I trust not. I second a thumbs down for DRYROTS. Well, I enjoyed this puzzle, unlike ET59. I solved it on paper, and like the look of the across clues just all being one word, streaming down the side of the page. I thought that the theme made up, in a big way, for there being no rebus. MOBILIZED was my favorite, with 29A We (PETITE) and 60A Slight (DEXTERITY) coming in close behind. I'll look for that book. Great review, Frannie.